I have to say, I was impressed with the Lazarus Naturals 50mg CBD capsules. At such a low cost per mg, and keeping mind that these capsules are vegan and pesticide-free, they made me a believer. 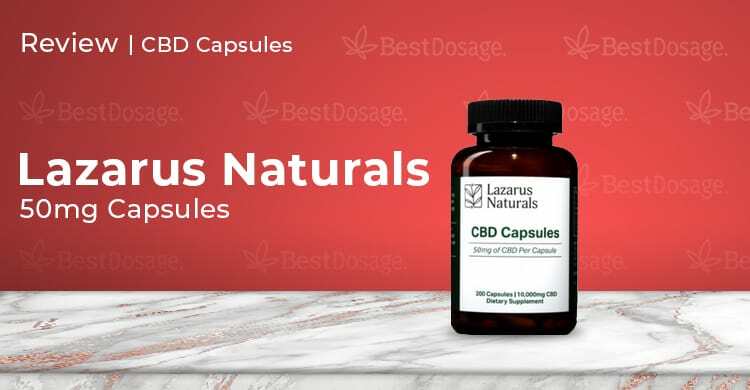 A beloved brand on Facebook, Lazarus now offers a high dosage CBD capsule. The Lazarus Naturals CBD capsules are 50mg per serving and are an easy solution to finding your daily dosage. I’m not a big capsule fan, but I was willing to see if Lazarus could win me over. This Seattle based, family run business has been around for five years. Lazarus made it big with their isolates. Their approach is beautiful in its simplicity. They focus on making high quality, yet affordable, CBD products in many different formats. They use organic, pesticide-free, hemp and extract CBD from it with kosher ethanol. This form of high-end extraction is part of what makes Lazarus one of the most popular brands of CBD on the market. Perhaps an overlooked product in their impressive line, Lazarus Naturals 50mg CBD capsules are gelatin free, gluten-free, and easy to swallow. They are all natural capsules with no artificial flavors, preservatives, or sweeteners. This is a full spectrum product, and Lazarus Naturals also combines organic terpenes such as d-limonene, myrcene, and beta-caryophyllene to aid in the overall effect. As with their other products, these capsules are 3rd party tested. The down to earth feel from the capsule is evident in the labeling on the bottle. The label was informative, with directions and dosages that are easy to read. The bottle itself is very sturdy and I can see how easy it would be to throw it in a purse or placed in a medicine cabinet. I knew Lazarus uses natural ingredients that are pesticide free, which was a big part of the appeal for testing this product. The capsules have no artificial flavorings so they are virtually flavorless. They are very also easy to swallow and fairly small pills. The capsules are 50mg and you cannot split them or cut them. Lazarus recommends taking them after you have eaten a full meal. The benefit of capsules is they are easy to measure exact dosages. At this dosage level, one would be enough for a lot of people, but dosing is also very individual. If you’re new to CBD, you might one to start with one of their lower mg capsules first and microdose your way up as needed. After I took the capsule I remembered that I had read online how most people do not feel the effects for at least one hour. I can say from experience that it’s a fairly good estimate. For me, the capsule took about an hour and a half to fully affect me. When it did, the feeling was strong and was felt throughout my body. It felt relaxing without a strong head high, which was exactly what I was looking for. After the product sets in, it lasts about 8 hours. There are no side effects and no withdrawals that I noticed. By the end, I started taking Lazarus Naturals CBD capsules the same way I would take an Advil. If I have pain, it’s the first thing I reach for. Rice flour, Silicon Dioxide, Hemp Oil, Fractionated Coconut Oil, and Organic Grapeseed Oil. Lazarus has a contact form on site and Facebook messenger. Their messenger has automated responses and is only open Monday through Friday 9am-5pm PST. A little sparse in the customer support department, but you can still reach them via Facebook if you have a problem, which is nice. Free shipping on orders over $50 in the US. They also ship outside of the US, but at a cost. You can get 8 capsules or 200, and the prices range from $10 to $360 per bottle depending on quantity and potency. It’s rare to find an effective CBD product that is both lab tested and cost-effective. I highly recommend considering Lazarus Naturals CBD capsules. Great product, two thumbs way up! I experienced a strong high, akin to a sativa, really increased the number of thoughts, and stoned ideas. Im a meditator of many years experience, and I recognize mental states quite well. And as a meditator, I like to be in my natural state of mind, which this was not. So this, was the opposite of what I was hoping for. That was on 25mg. Took the capsule apart (which is easy to do despite the above) and used only half the next time. Same result, but not as long or strong. i don’t know if this effect lessens with regular use, but I wanted to use it in my daily life, in situations where I need to concentrate, so Im disappointed.